We love the scrolls of this Elegant Tile Stencil! It’s a beautiful and classic tile design. Our Tile stencils are the perfect money saving alternative to the popular but expensive cement tiles. 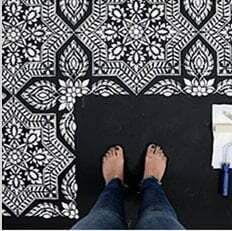 You can stencil right over your old dated tile floor, cement floor or even an ugly linoleum floor! Just make sure you’re using the right materials and techniques. Please check out our illustrated step-by-step Tile stencil tutorial! With our Tile stencils, it's easy to create a dramatic tile kitchen backsplash. Get a Pinterest-worthy DIY cement tile floor for a fraction of the price of real tile!